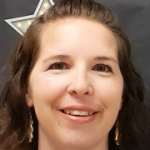 Erica Sommer is a special education teacher in Del Valle Independent School District, which serves students in and around Austin, Texas. 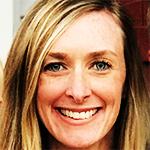 Sommer works closely with the district’s substantial English learner population, has almost 15 years of teaching experience and has been passionate about teaching for as long as she remembers. She shared with us how working with English learner students and those with disabilities has impacted her as a teacher and individual. English learners make up one of the most diverse student groups in schools today. When English learners enter our schools, they come from varying racial, ethnic, linguistic, socio-economic, educational, and cultural backgrounds. Serving the needs of English learner students, particularly those identified as having a disability, can be a challenge for schools and teachers, but it is also an interesting and exciting group of students to teach and learn from. I have had many unique opportunities to work with English learners who are also students with disabilities both at the very beginning of my career in Kansas City, Kansas and now, as I work with students in and around Austin, Texas. In Kansas City, I worked with English learner students with disabilities who were part of a public-private school partnership in the district. In my current school district, bilingual students make up about 87 percent of the student population, and about 60 percent of those students are English learners. I really enjoy this work, especially the relationships I’m able to build with individual students and their families. Over the past two years, I’ve been working with a young English learner with learning disabilities including dyslexia. She has been such an inspiration to me. 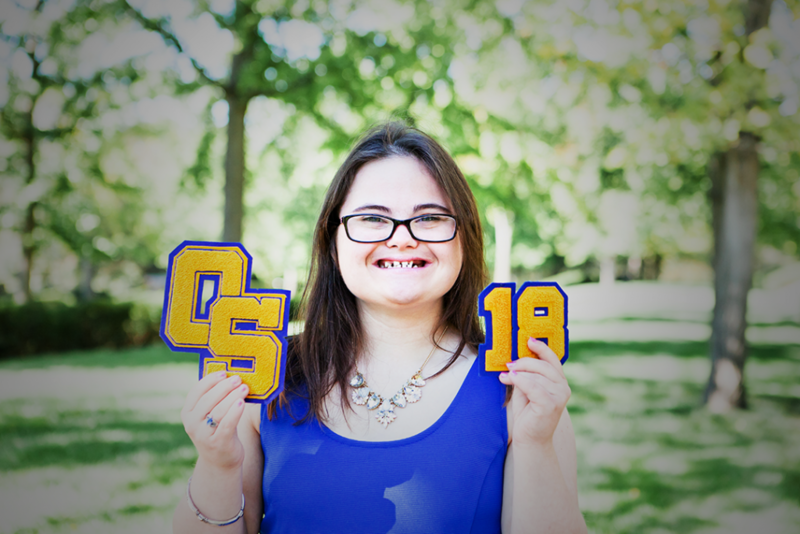 She is the hardest working student I’ve ever worked with, and I can’t wait to get invited to her high school graduation! Teaching English learners with disabilities is of course challenging at times, but those challenges become learning experiences. I have found several strategies that work well when facing challenges in my work. I learned to ask for help when communicating with parents. This sometimes requires getting a translator, and these situations have helped me to develop another skill, which is to learn how to communicate effectively while using a translator. I have learned to be flexible and open to change. I have learned the importance of connecting with classroom teachers and advocating for my students. I work with bilingual teachers and mainstream teachers in settings that are more collaborative and less formal than an official individualized education program team or planning meetings. What we do is more about coordinating our work and sharing professional development opportunities and information. We work together like this because we know it will make our jobs easier and ultimately benefit of our students. I think that the best way teachers and schools can help English learners, students with disabilities and all kids is by working with their parents. Reach out and learn how to effectively communicate with parents of English learners because this can be absolutely crucial to a child’s success in school. We, as teachers, can be someone who influences our students’ whole trajectory in life. The most rewarding part of my work with English learners with disabilities is actually saying goodbye to my fifth graders, and knowing they have so much more to do and accomplish! These students make a big impact on me as an individual, especially those who are particularly surprising and the most challenging. I often find that my students who seem tough and rugged throughout the year are the same students who cry and hug me on the last day of school. 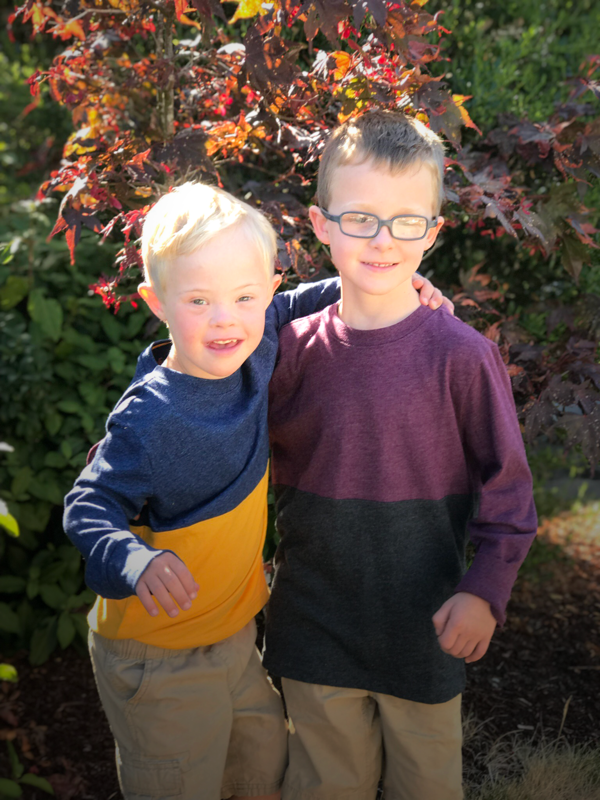 In addition to announcing OSEP’s new director, Laurie VanderPloeg, and interviewing Caryl Jaques at Little One’s University preschool, this October, we highlighted aspects of disability awareness for National Disability Employment, Dyslexia, Learning Disabilities, ADHD, and Down Syndrome! Courtney’s twin sons just started kindergarten. This military family also moved across the country this year. 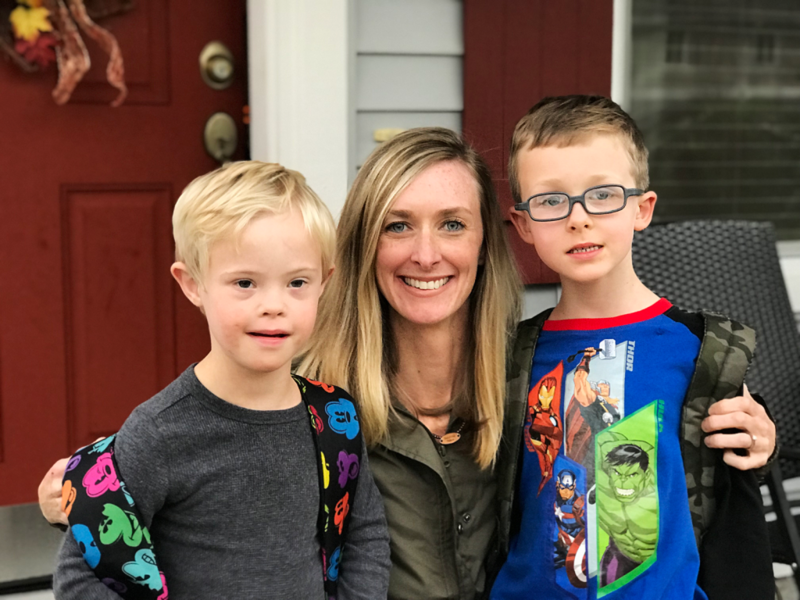 Read how she’s advocated for her son with Down syndrome to be included in the same class as his brother. Rachel, a 19-year-old, loves her family, friends, school, social activities and so much more. 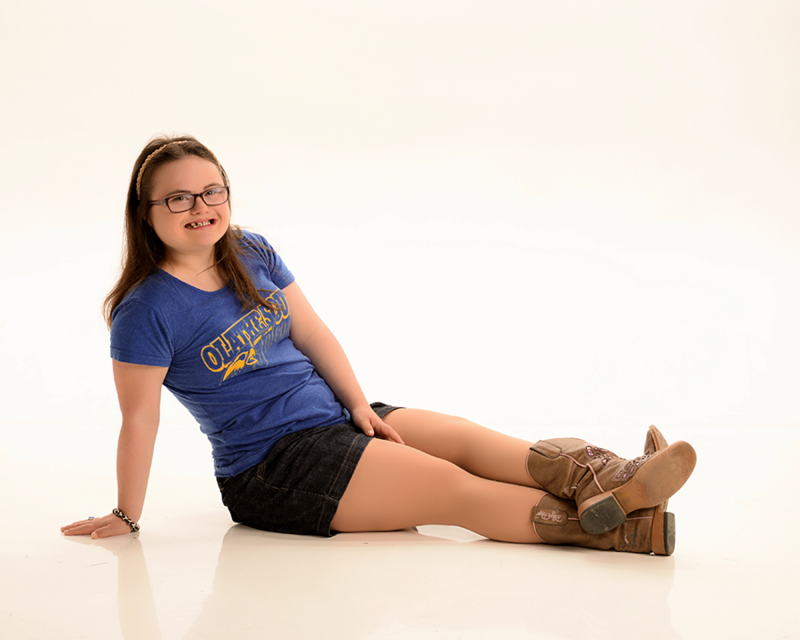 She’s traveled to DC and testified in Topeka to talk about laws that will help people with Down syndrome. 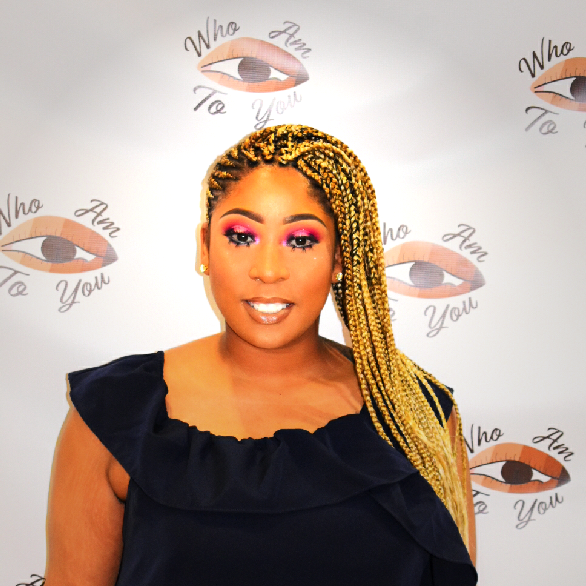 Lena struggled through middle and high school, but she eventually earned her GED, an associate’s degree and a bachelor’s degree. 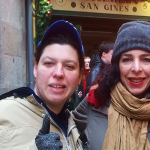 Read how Lena learned more about her learning disability, accepted her challenges and found her voice. 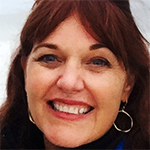 Beth McClure envisioned a school designed specifically to provide excellent reading instruction to all students, so she started Strong Foundations School, a public charter school. 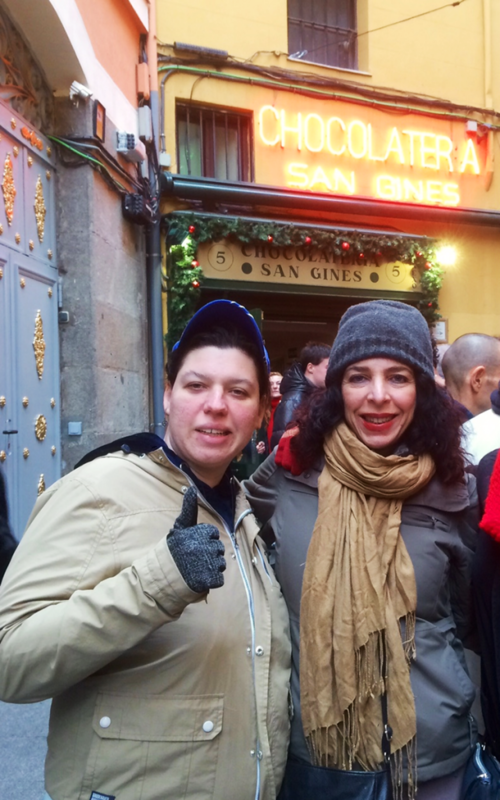 Myriam recounts her journey from a young, new mom learning her daughter had a speech delay and attention issues to a career assisting other parents of children with disabilities to help them navigate their rights and get involved in their child’s education. 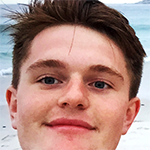 Dylan is a college sophomore, a soccer player and ceramic artist who loves to travel the world when there’s time. He also has dyslexia. 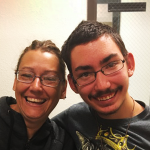 Dylan and his mom share their story in hopes of inspiring others. One mom, two sons 10 years apart in age. 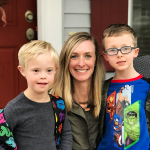 Candice shares her family’s story of the vastly different experiences they had when seeking educational supports and services for her sons with disabilities and ADHD. 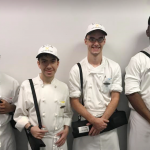 Hands On Educational Services, Inc., a vocational training program that prepares individuals with disabilities for careers in the hospitality industry, celebrates its 20th year of partnering with Hyatt. Learn different ways to stay current with employment trends related to the workforce and people with disabilities. Way2Work helps Marylanders with disabilities transition into the workforce. Check out some of their success stories! The Alaska Division of Vocational Rehabilitation and Nevada Ready show how states are creating programs to help youth with disabilities transition into a work environment. The National Technical Assistance Center on Transition (NTACT) has many resources that help state and local education agencies, state vocational rehabilitation agencies, VR service providers and other service providers prepare student with disabilities for successful postsecondary education and employment. 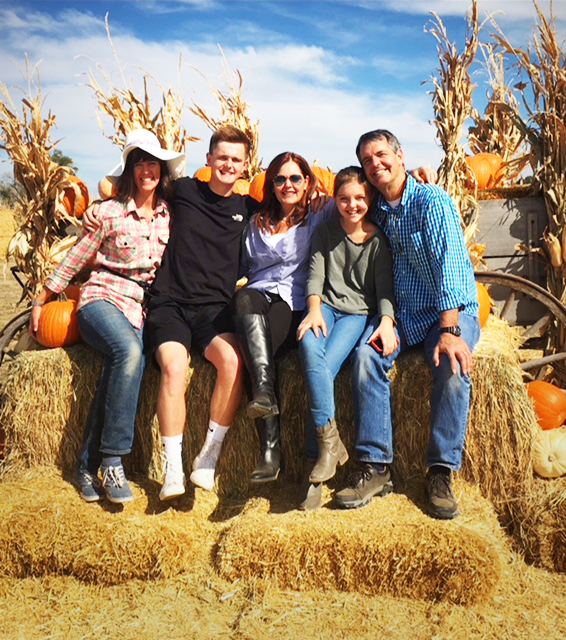 With the help of ASPIRE, families in Arizona, Colorado, Montana, North Dakota, South Dakota and Utah are taking charge of their futures, learning about benefits available in their state, and more. OSERS Rehabilitation Services Administration’s grant recipients offer numerous training materials and resources for those interested in vocational rehabilitation. Learn how to find these resources through the National Clearinghouse of Rehabilitation Training Materials (NCRTM). 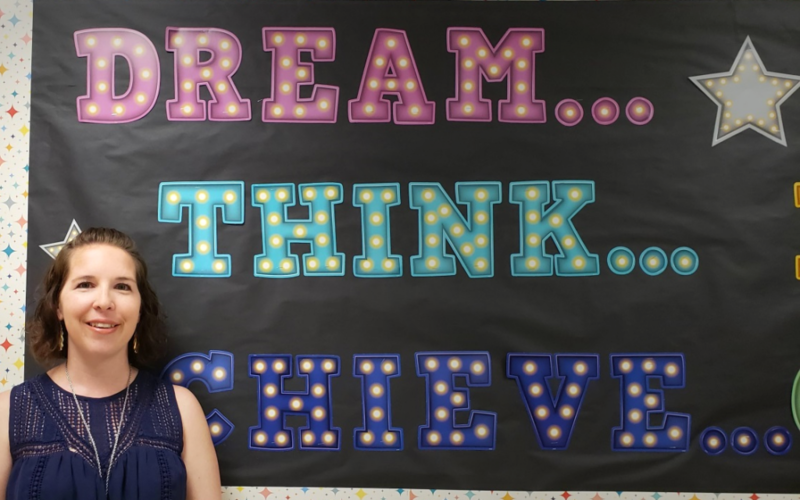 Meriden K–12, a Connecticut public school, gets creative to help students like Nyrka find success by bridging the gap between school and adult life. The Arkansas PROMISE program shows how a personalized connection between youth & their families and case managers can leave a positive, lasting impact on youth with disabilities. 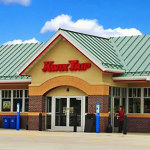 The Wisconsin Workforce’s Division of Vocational Rehabilitation worked with KwikTrip, a family-owned business of convenience stores, to successfully recruit and train individuals with disabilities for the role of “Retail Helper. Calling all vocational rehabilitation professionals. Did you know NCRTM provides quick, streamlined access to resources and technical assistance centers funded by OSERS Rehabilitation Services Administration? Ida’s a Drew University senior with a recent internship and employment offer from JPMorgan. She’s also legally blind. 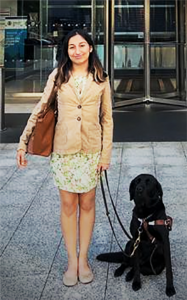 Read Ida’s story and about her work with the New Jersey Department of Human Services Commission for the Blind and Visually Impaired. Christopher has a computer science degree. 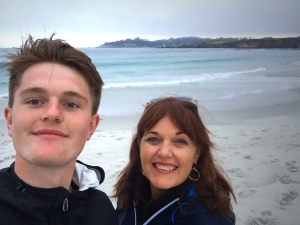 Yet, he applied to nearly 600 positions without much success—that was until a California Department of Rehabilitation vocational rehabilitation counselor helped him connect with Microsoft’s Autism Hiring Program. 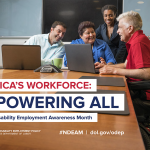 OSERS and OSERS Rehabilitation Services Administration proudly supports numerous programs relevant to National Disability Employment Awareness Month. 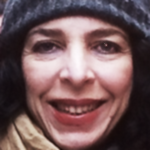 When my first child was born I was a young and inexperienced new mother. My husband and I had just moved to the United States from Venezuela, and we were far away from our relatives. I wasn’t sure if I should speak English or Spanish to our first daughter, and felt really perplexed. Everyone told us to stick to one language because children might get confused when they were spoken several languages at a time. Once I realized my daughter had a speech delay and attention issues, I started to read everything I could about early child development. I felt very overwhelmed and isolated. The pediatrician referred our child to an evaluation center in Miami where we lived. All our concerns and intuition were confirmed: our four-year-old child had some type of learning disability. The year was 1994, and I didn’t know anything about Individualized Education Programs (IEPs) or the Individuals with Disabilities Education Act (IDEA). 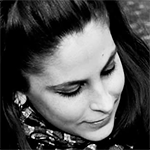 Veronica’s private speech therapy sessions were conducted in Spanish. Since we lived in Miami, a very bilingual community, the Spanish-speaking speech therapist recommended us to enroll our daughter in a bilingual cooperative preschool that existed in the community. The preschool teacher referred our daughter to our school district to have a series of tests. Then, Veronica had her first IEP. A few IEPs later, it was determined that Veronica not only had a learning disability, but she also had “pervasive developmental disorder not otherwise specified.” In other words, she had a form of autism. When Veronica was in the fourth grade, I found a flyer in her book bag about an organization that would assist parents of children with IEPs understand their rights. That flyer changed my life! The organization was Parent to Parent of Miami, a federally funded Community Parent Resource Center in South Florida. I contacted them and got all the information and assistance I needed at the time. Then, I decided that I wanted to work there! I wanted to help other parents, especially immigrant parents like me, understand their rights and get involved in their kids’ IEP process. My lucky day came a couple of months later when I found another flyer in Veronica’s book bag. This time the flyer said that Parent to Parent of Miami was looking for bilingual parents of children with IEPs to work helping other parents. The year was 2000, I got the job, and I have been working within the Parent Center Network since. Another big move awaited us, and we ended up living in New Jersey. As soon as I knew we were going to live in NJ, I contacted the SPAN Parent Advocacy Network, the New Jersey Parent Training and Information Center, to get information about the school system in our new state and to get a job or a volunteer position at the parent center. I started working at SPAN in 2003. During my 15 years at SPAN, I have worked on several different projects from helping parents organize advisory groups to training parent mentors under New Jersey Parent to Parent to coordinating the OSEP English to Spanish Translation Glossary project to working on two national projects assisting parent centers across the regions. My trajectory at SPAN has helped me empower my daughters to speak up, fight for their rights and have high expectations in their lives. It also has made me appreciate the impact of the civil rights and the disability movements in our society at the local and national level as well as globally as an international community. 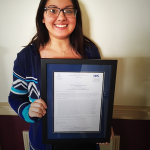 Veronica attended a public high school in northern New Jersey where students with and without IEPs share the same building; and for most of the students, they also share classrooms and after-school activities. 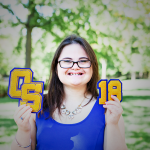 Veronica grew up in a naturally inclusive environment and was part of her high school basketball team. She participated in several SPAN transition-to-adulthood trainings and workshops. 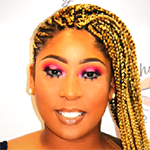 In addition to her high school academic courses, Veronica sampled jobs in the community, volunteered for several years at a summer camp for younger children in the spectrum, and learned to use public transportation as part of her IEP goals. Now, Veronica is an adult who takes classes at the local community college and has a very active social life that includes a fiancée. Recently she got her driver’s permit and was admitted into the 2018-2019 New Jersey Partners in Policy Making cohort. As for speaking English and Spanish with my daughters, I speak both languages with them, and it’s wonderful. I REALLY Love My Life! I am Rachel Mast. I am 19 years old. I really love my life. I have a great life, and I love telling people how great my life is. I was born in Memphis. In third grade, my family moved to Olathe, Kansas. I love lots of things about my life. I love my church. I love my school. I love my family. I love dancing, acting, and singing. One of the best things about my life is my friends. I graduated from Olathe South High School in May. Just like my friends, I got a diploma. I loved my school. I was on student council, and was the volleyball manager for four years. In ninth grade, I was on the Winter Court. I was the Prom Princess. I was in National Honor Society and on the honor roll. I took general education classes with my friends. My favorite classes were my theatre classes. Even though it was hard, I learned Shakespearean monologues. It is hard for me to memorize, but I worked very hard and did a great job. 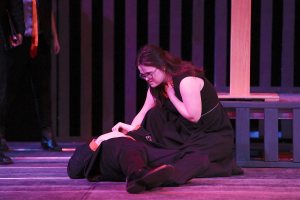 One of my best high school memories was being Strato in “Julius Caesar.” I am a member of my school’s thespian troupe. I have my name on a brick at my school. I liked all my classes, but I don’t like math very much. Math is hard for me. I really like English. My favorite book was “Romeo and Juliet,” but I didn’t really like “Frankenstein.” I worked very hard in my classes, so I could make good grades and go to college. I really liked my parenting class. We pretended we were going to have a baby—that was funny. I had to bring a baby home and I named her Sarah Nicole. She cried three times during dinner. I decided I do not want children. My senior year, I worked in the attendance office and the counseling office. It was so much fun. I took passes to people and greeted people. They told me my smile made everyone happy. I just got a job as a hostess at the Olive Garden. It is kind of like what I did in the school office. One of the best things I remember in high school was scoring a touchdown at the powder puff football game. During homecoming weekend, the junior and senior girls always play a powder puff game. My friends helped me out and, when I got the ball, I scored a touchdown. It made me have happy tears. I love my friends very much. My volleyball friends called me the #bestmanagerever. I gave them pep talks. My theatre friends helped me to know when to do things on stage. They helped me when I was on the crew for the “Addams Family.” I love them very much. My friends from church are the best. We go to church camp together. We went on mission trips. We had fun. I miss them very much. We still pray for each other. 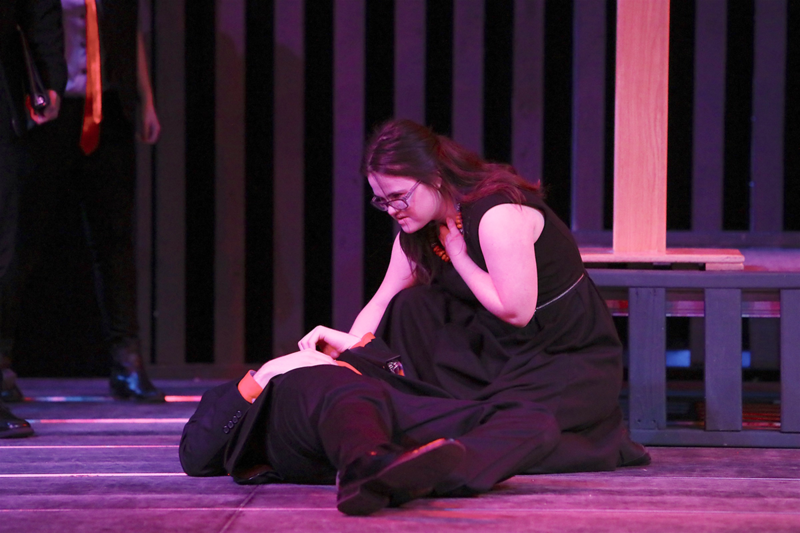 Theatre is my life. I have been in 22 plays. My favorite was “Hairspray” because I love to dance and sing. I have the same dreams as my friends. I want to go to college. In January, I am going to start as a student at Missouri State University. I will be in the first Bear POWER class. I am so excited to live in the dorm, take theatre classes, and make friends. Some of my friends go there, too! When I started going to Washington, D.C., I told them to support the ABLE Act so I could live in a pink house. My dream is to move to New York City, be on Broadway, get married, and live in a pink house. Did I mention I have Down syndrome? 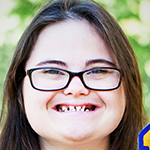 I have Down syndrome, but I am not Down syndrome. I am Rachel. I have dreams. I REALLY love my life. —Charles Kettering, American inventor, engineer and businessman. As parents, we all want to see our children reach their full potential. Our visions of their successes and accomplishments may vary, but we all yearn to guide our children to greatness. How do we set them up to fulfill their potential? What foundations are we building for them? What roadmaps can we provide to help them navigate on their journey? I am the proud mother of three terrific children (Biased? Yes!). While each of them is unique and inspiring in their own abilities and qualities, my sons have some very distinct similarities. In the early school years, both began showing similar behaviors: high impulsivity, defiance, acting out, disruption, the inability to follow direction and under-developed social skills. Both were bright and strong willed and insisted on doing things their own way in their own time. They were both evaluated at five years old, 10 years apart. That’s where the similarities ended. Let’s start with my older son’s journey. In 2007, at age five, he was diagnosed with attention deficit hyperactivity disorder (ADHD), pervasive development disorder otherwise non specified (PDD-NOS) and anxiety. His individualized education program (IEP) team, despite all good intent, viewed my son through a deficiency lens. We let the troublesome behavior take the driver’s seat. His aptitude for learning did not seem to align with his behaviors. The behaviors escalated. The suspensions began. His progress regressed, and his growth stalled. We changed schools often. Even though we began as advocates, we soon became adversaries in IEP meetings. On the other hand, my youngest son has had a very different experience. 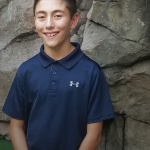 At age five, he was diagnosed with anxiety and showed a high likelihood of having ADHD. He was also identified as gifted. We worked closely with his school to find a teacher who was a good fit and we collaborated with the occupational therapist, the talented and gifted team, and the area education team, just to name a few. We first took a close look at youngest son’s evaluation and began the work of identifying supports and developing a plan for acceleration. His problem behaviors were seen in the context of his aptitude and understood as a part of his development as a twice-exceptional student. His IEP centers around his strengths. And yet, we have only just begun to build the foundation of his future achievements. There is still far to go. If you ask me, the major difference between my two children is in the way that we view them. After all, children with learning and attention issues have a unique set of challenges, and my children are not alone. Children with learning and attention issues make up 1 in 5 students in our nation’s public schools. Kids with learning and attention issues account for two-thirds of the children with IEPs who are suspended or expelled. They are 31 percent more likely to be bullied than kids without disabilities. They are three times as likely to drop out of high school as kids without disabilities, and half of all kids with learning disabilities are involved in the juvenile justice system by young adulthood. These numbers could describe my oldest son, and that is alarming for me. What drives these numbers? And what can be done? We must set high standards and expectations for our kids. We must encourage and support our kids to meet the same expectations as their peers, and make sure they are engaged and feel a sense of ownership of their learning. We must encourage our students to view a wrong answer as a learning opportunity, rather than a shortcoming. We expect insight and reflection to instill a lifelong journey of learning. Our expectations should likewise remain lofty. When we have low expectations of our students, we allow for minimal effort. Student engagement, self-advocacy and achievement will most definitely stall when the bar is set too low. Self-esteem and gaining a sense of confidence in one’s abilities are lifelong benefits with roots in meeting high expectations. We can make high expectations real for so many more kids if we focus on their strengths. Using strengths as a framework for educational support and structure will allow for children to use their natural abilities and talents to reach their highest potential. Across the country, school districts are taking a new approach with Strengths Based IEPs. The move to this type of IEP will certainly require greater professional development for educators in each district. Parents can go to school board meetings and demonstrate their value, but there are great resources for anyone who wants to begin this process within your school or community. Using a strengths-based approach made an incredible, positive difference for my younger son. Setting high expectations and focusing on strengths allows parents and educators to view our students through a mindset of competence and high achievement. The tools are available and my family has seen the impact firsthand. So let us begin the work to build the foundations of an exceptional educational experience for every child! 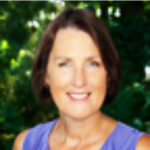 Understood Parent Fellow with the National Center for Learning Disabilities. Medical Assistant in Pediatric Specialties, University of Iowa. 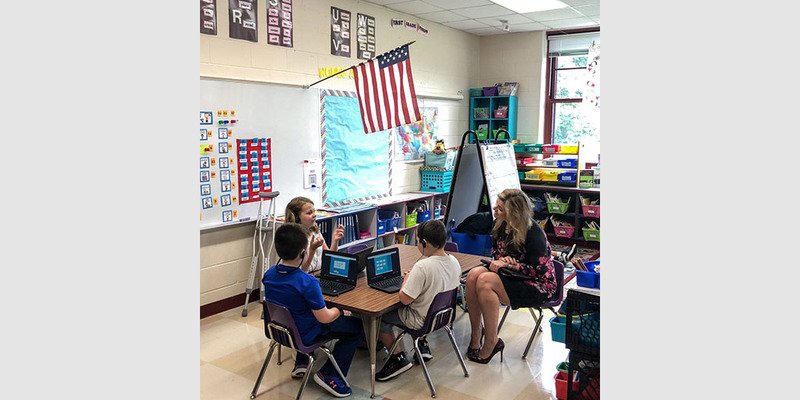 OSERS Deputy Assistant Secretary Kim Richey and I spent the week of September 10 traveling as part of the U.S. Department of Education’s 2018 Back-to-School Tour. 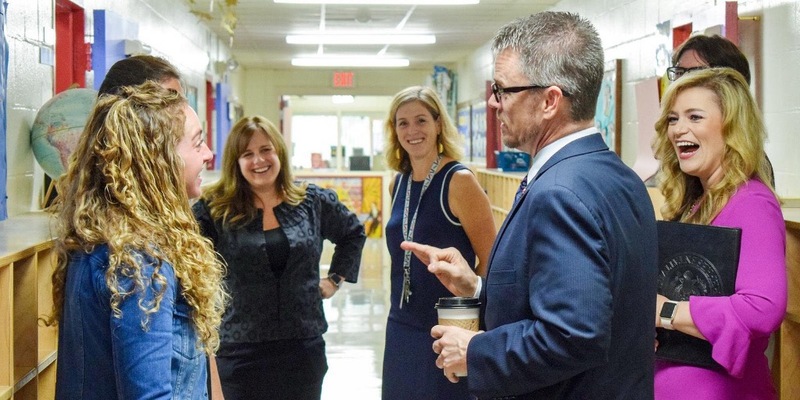 During the week, ED leaders toured the country to get a closer, first-hand look at how schools are meeting the unique needs of students. We were encouraged by how these schools are rethinking education to ensure nothing limits their students from being prepared for what comes next in life―whether it is continuing their education, transitioning to a work environment, both, or whatever is their next right step. We heard from diverse education stakeholders at each school. They provided us with great information, and it was incredibly helpful to benefit from their unique perspectives and experiences. We were reminded again, that those closest to the child really do know best about their education, and that the best ideas and innovations to ensure the success of children come from them, and not from Washington. First, we visited Maine’s St. George Municipal School Unit and the Baxter Academy for Technology and Science. They knew that science, technology, engineering, arts and math (STEAM) initiatives could help their schools better meet the needs of all children. St. George Municipal School Unit, a public kindergarten through eighth grade school, has employed a “makerspace” for students to experience both high-tech and low-tech tools to learn, explore and share the world around them and turn their imaginations into tangible creations. The Baxter Academy for Technology and Science, a public charter high school, exposes students to science, technology, engineering and math (STEM) career fields and professionals while still offering students a strong humanities curriculum to cultivate well-rounded individuals and passionate, self-directed learners. STEAM and STEM activities at these two schools help support students with disabilities build confidence in their own abilities, be introduced to technical skills that they can apply to future career endeavors, and explore possibilities that may not have been available to them if schools did not challenge themselves to rethink how they best serve students with disabilities. St. George Municipal School Unit and the Baxter Academy are preparing America’s students for professions not yet imagined. We visited the Regional Services and Education Center (RSEC) and the Strong Foundation Charter School in New Hampshire Tuesday. These schools know that a one-size-fits-all or one-size-fits-most approach to educating students does not work. 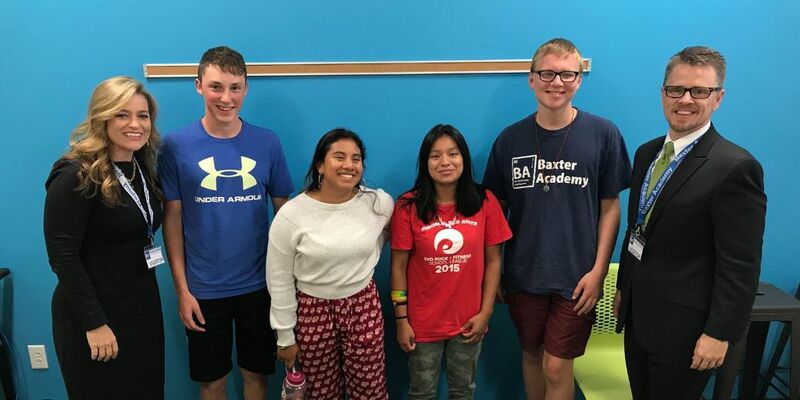 The RSEC Academy’s middle and high schools specialize in the education of sixth through 12th graders with learning disabilities as well as other social, emotional and behavioral needs. RSEC Academy prepares students to transition from middle school to high school to graduation and beyond by ensuring students have access to educators and staff trained to support individual student needs. We had the opportunity to speak to students, faculty (including their Positive Approach to Learning Disabilities team), and alumni. Each person had a unique story to share, which helped to further emphasize the importance of individualized decision-making related to students’ needs. The next school we visited in New Hampshire was the Strong Foundations Charter School, a first through eighth grade school whose history highlights the importance for families to choose a learning environment that works best for their student. Founded as a public charter school, Strong Foundations formed in order to provide comprehensive reading instruction to all students and improve student literacy and reading outcomes. 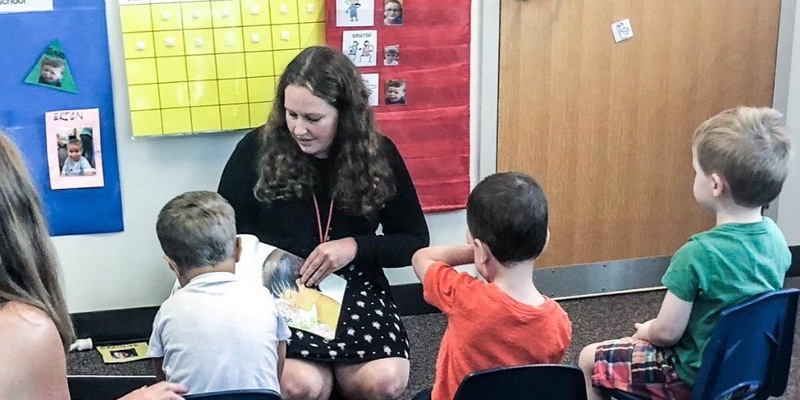 New Hampshire Education Commissioner Frank Edelblut joined us as we observed students taking part in structured reading lessons and when we met with teachers, special educators, the school’s principal and board members. 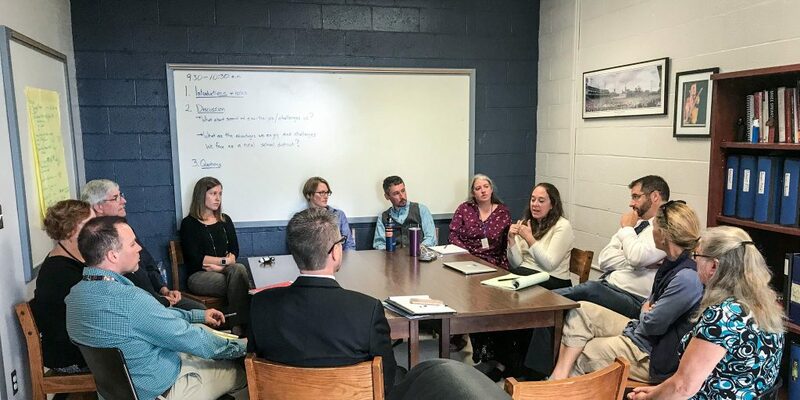 We had the opportunity to visit traditional public schools, as well as private schools to see how Vermont’s public and private schools’ partnerships are helping to ensure students have opportunities in a variety of school settings. We started at Essex Westford School District’s Hiawatha Elementary, a pre-K through third grade public school. We participated in the students’ morning routine including their interactive classroom meeting before observing direct instruction with a student using augmentative and alternative communication. Hiawatha demonstrated the importance of a customized learning experience to improve outcomes for all students. Through our interactions, observations and discussions with the Hiawatha community, we witnessed what is possible when schools work to empower students, give them their own voice and way of communicating, and support individual needs. 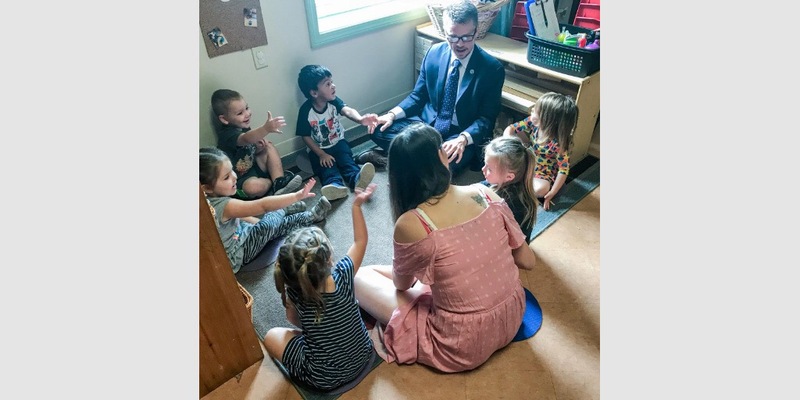 We followed our visit to Hiawatha Elementary with a tour of Vermont’s Little One’s University, a private preschool that has partnered with its local school district, Essex Westford. Their focus on early childhood education showed how providing early learners, including young learners with disabilities, with the proper educational foundation can set them on a path for success. As part of a private/public partnership, we toured the school and interacted with preschool learners in an inclusive setting with and without disabilities. 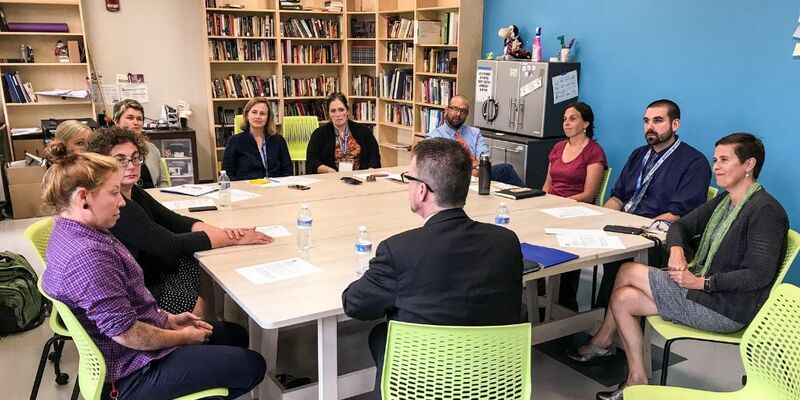 We were thrilled to have Vermont’s Secretary of Education Daniel M. French join us as we met with a diverse group of stakeholders that included parents, teachers, special education directors and school administrators. 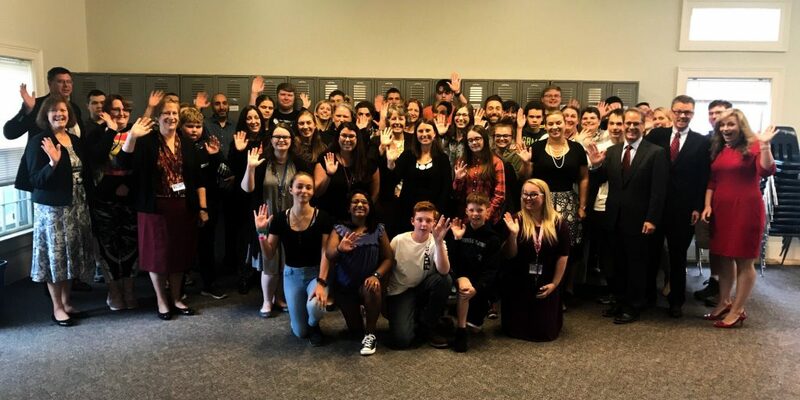 While in Vermont, we also visited the St. Johnsbury Academy, an independent coed day and boarding school that, in partnership with public schools, provides public school students with an education that best meets their individual needs. The academy offers a variety of educational experiences such as bio-medical and health services certificate, culinary arts, fashion design, and pre-university engineering and robotics. The academy also has on-site adult education courses, including training certificate programs, through a partnership with Vermont Technical College and the Vermont Department of Labor. We met with parents and students to hear why they chose an independent school, and we spoke with representatives from local education agencies in Vermont regarding the public/private partnerships with St. Johnsbury Academy. The insight provided by these parents, students, educators and LEAs offered valuable information on the importance of educational options for students with disabilities and their families. 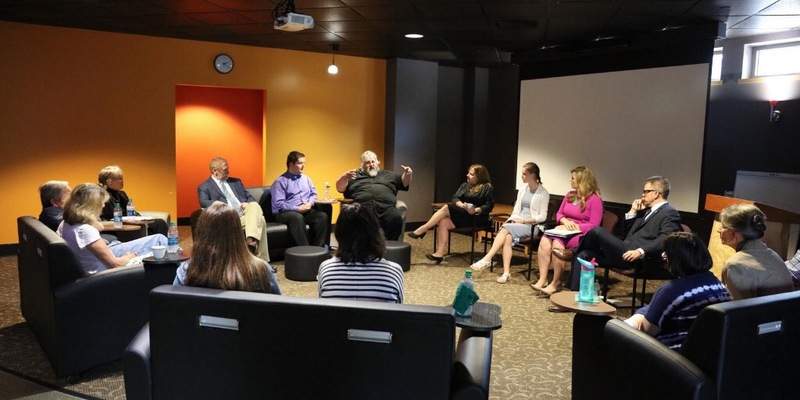 Vermont offered us a wonderful opportunity for a listening session with administrators, educators, families, students and other special education stakeholders to discuss what excites them and what challenges them about the education of students with disabilities. It was evident that each person was committed to high expectations and improved outcomes for people with disabilities. We spent Thursday morning at the Meriden Public Schools system in Connecticut. Meriden Public Schools offered us a view of services and supports from early childhood education through post-secondary activities. At Meriden’s Hanover Elementary School we saw the early learning wing, discussed ways they support students with disabilities, and visited their inclusive playground. We also had the opportunity to hear presentations from students and learn more about Platt High School’s college and career readiness initiatives, which include working with select ninth grade students requiring additional support of the basis of grades, attendance or behaviors to plan their paths for success as a way of helping them set and achieve goals. In addition to Meriden’s high school initiatives, we learned about their school’s Community Classroom Collaborative (CCC), a community based program that serves student with vary disabilities ages 18 through 21 in an age appropriate and natural environment, and the Success Academy, a program that provides individualized support and student-centered options for students in the district as they work toward their goal of graduating to receive a high school diploma . We learned how they chose to implement these programs, heard the reasoning behind establishing these programs, and listened to success stories of equipping students with the tools they need for the future. Programs like those in Meriden show there are many avenues for students to find success. The district’s focus on the individual helps to prepare students for success, no matter what that version of success might look like. We visited Rhode Island’s Hugh Cole Elementary school Thursday afternoon. 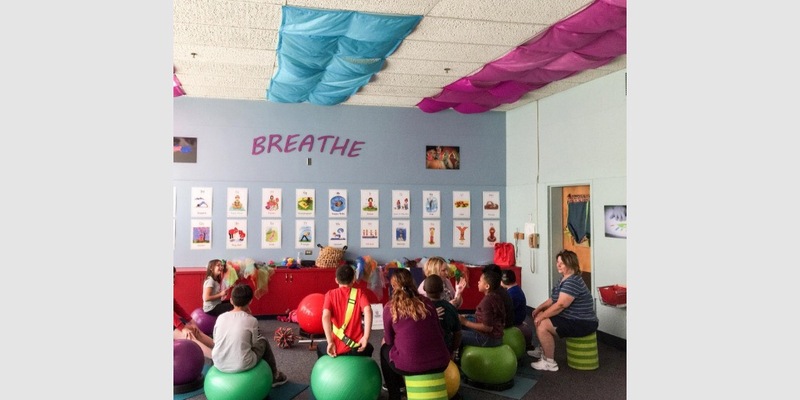 This public elementary school uses data-based individualization within a multi-tiered system of support framework to meet particular intervention needs of its students. While at Hugh Cole Elementary, we observed their individualization strategies, heard about the school’s teacher development/support efforts throughout the years, and how the school makes its practices sustainable and replicable. Our New England Back to School Tour concluded Friday in Massachusetts. The Reading Public School District showed how their district works with students with disabilities from early childhood through high school. We had the opportunity to meet with staff from their Respect, Inclusion, Safety, Effort (RISE) Preschool, which emphasizes the needs of individual students. About half of RISE Preschool’s classroom students receive extra support to help them grow and develop based on their needs. At the elementary school level, we observed co-teaching in kindergarten and fourth grade classrooms in Reading’s Birch Meadow Elementary School. We also spent time at Reading Memorial High School to round out the full picture of the supports and services provided to the district’s students with disabilities. Throughout the day, discussions with various staff including teachers, administrators, the district’s data and behavioral health coaches, and students demonstrated what it looks like when a district thinks holistically about the education of students with disabilities. Rethink school. Question everything. Challenge the status quo. 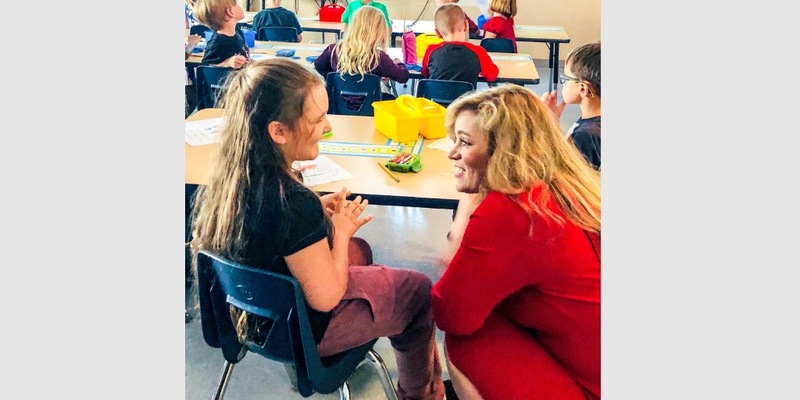 Kim and I traveled to six states in five days and loved the opportunity to visit schools and meet many new people who are committed to doing what is right for each student. Students, parents and school personnel were eager to share their programs and stories with us. What we saw at the schools excites us about the possibilities of what can happen when people challenge the status quo of special education. This week’s Back-to-School Tour further demonstrated that we must collectively continue to have the courage and perseverance necessary to make needed changes to our systems at the federal, state, and local levels if we are to achieve the goals that we, and most importantly the individuals we serve, envision. Systems change is not easy, does not happen quickly and is not accomplished by a few. However, it’s worth it because at the heart of the system are the individuals we serve and their futures. The work is too important, the need is too urgent, and the stakes are too high for us to settle for anything less than whatever it takes to deliver on the promises made to students and families. I’ve been asking people to join me in rethinking special education and in asking difficult questions that challenge the status quo of special education in our country. “Tinkering around the edges” is not going to get us to the goals that we envision. I look forward to future visits to other states to see and highlight important work being done by states and schools to raise expectations and improve outcomes for children with disabilities.